Bringing the joy and excitement of live music to school children is one of the things which SUWO considers most important. During our recent Tour to the South Coast we were able to fulfill this aim, as well as having the opportunity to work with the Shoalhaven Community Concert Band, and also indulge in a lovely holiday after the stress of exams. Everyone left their respective parts of Sydney (or Canberra, in Shakira’s case) bright and early on the morning of Sunday the 20th. 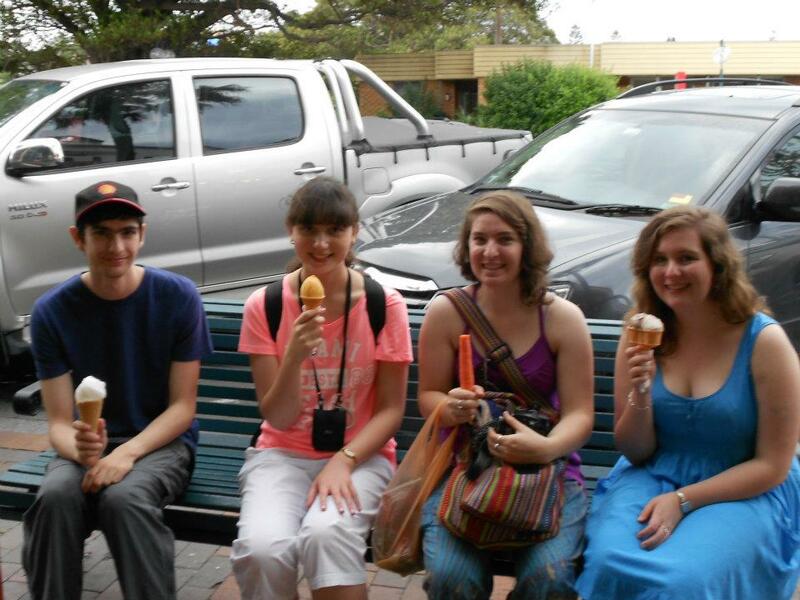 Meeting in Kiama for lunch, we had the first inkling that this coastal holiday may not bring all that was desired in weather… After arriving at The Nowra Guesthouse, our home for the coming days, we soon settled in. Although a few comparisons were made between the house and a certain horror movie, the old style wooden décor and heavy carpets indicated the building’s luxurious past. I’m not sure exactly when everyone ‘discovered’ Guitar Hero, but I have an inkling that it may have been early on, during one of our languidly relaxed periods of free time. For this particular form of entertainment, which saw many members of SUWO try their hand at a different kind of musical skill, we can thank Jonathan. We can also thank Jonathan for his many photographs, some of which feature in this article. He even managing to capture the rest of the orchestra playing during the rests in his music! Sunday evening was spent in combined rehearsal with the Shoalhaven Community Concert Band under the able baton of our Tour conductor, Marcus Bortolotti. 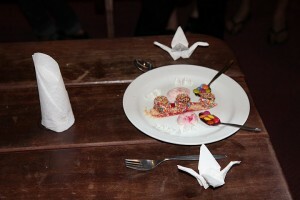 We ran through the scores, put everything in order, shared a lovely dinner and then came home to have a nice relax. 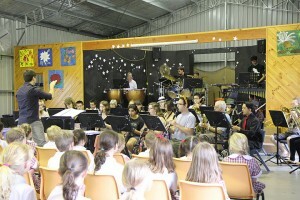 Monday saw us undertake the first of our schools concerts at Nowra Hill. It seemed to be quite a small school, situated quite a long way from anywhere, with most of the children coming from the nearby HMAS Albatross. 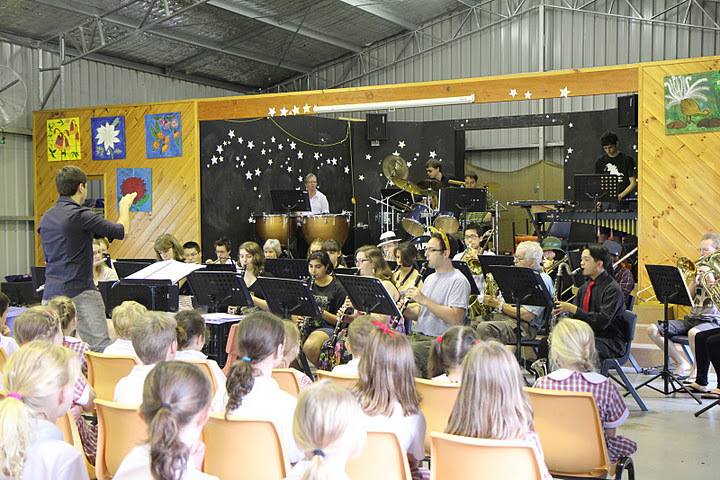 All the kids were packed into the school hall, which looked quite like a corrugated iron shed, and everyone enjoyed the music – the principal even asking for an encore! The theme of these concerts was ‘Hollywood’ and our young audiences greeted our renditions of various well-loved movie themes with enthusiasm. Particular favourites were Toy Story, Star Wars and of course, Pirates of the Caribbean! The rest of the day was spent at Huskisson, enjoying one of the few moments of sunshine. After a long walk along the beach, and of course fish and chips, some daring souls enjoyed a swim in the surprisingly nice water, while others tried their hand at sand sculpting. After a few afternoon naps back at The Guesthouse (no names mentioned…) the barbeque was lit and dinner cooking got under way. Once dinner was finished, cleaned and digested, it was time for a brilliantly orchestrated Games Night! Not only was our knowledge tested with trivia, our musical ability examined in an activity similar to the ‘Substitute’ round in Spicks and Specks, but our culinary and decorative skills came to the fore in a Masterchef competition to create the best dessert. On Tuesday we visited both Nowra Public School and St Georges Basin. At Nowra Public we were met by a reporter from the local newspaper, and orchestra members spoke passionately about the importance of our schools concerts program. 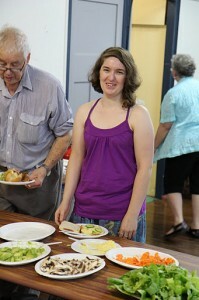 To read the article from the Shoalhaven Nowra News click here. The chill in the air led everyone to decide to go to Berry for lunch, with the ice creamery and lolly shop eagerly visited in the afternoon. That evening saw us invited to the normal rehearsal of Shoalhaven Community Concert Band. It was exciting and interesting to play with both the junior and senior bands, particularly to see another conductor in operation and ‘see how they did it’. 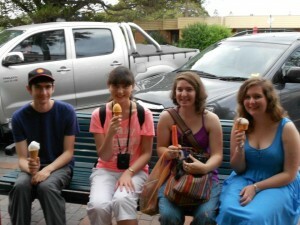 The cold and drizzle on Wednesday morning saw us re-evaluate our plans to go to Jamberoo Action Park. We decided instead to visit the café at a local lookout, however, when we got there, after braving the foggy winding mountain roads, we discovered it was closed. So alternatively, after a snack and warm drink at Kangaroo Valley, everyone went their own way, and Tour was over for another year! Thanks must go to the members of the 2011 Executive, and in particular to Vice-President Laura Sheehan, for her amazing organisation. Thankyou also to Marcus Bortolotti for conducting us and to everyone who came along.